A wide economic moat allows a company to generate returns greater than the cost of capital or higher than the average of its competitors. A business that has lower-than-average costs of operations in terms of production and distribution can benefit by 1) charging similar prices as its competitors, enjoying higher-than-usual profit margins on each sale or 2) charging less than the competition, generating high sales volume and overall profits. Low costs can be a long-term advantage particularly when the quality of goods and services are maintained. Low costs can be achieved in many ways, such as economies of scale in purchasing and production; investments in technology and distribution methods that improve efficiency; integrated production through partnerships with and/or ownership of suppliers; inexpensive raw materials; sources of inexpensive, reliable labor; and supply chain infrastructure that holds down expenses while properly servicing customers. Examples of businesses with low-cost moats include FedEx, which offers excellent value for shipping services, and Wal-Mart, which offers low prices on consumer products. Many industries and businesses enjoy an environment in which customers find switching providers costly, time-consuming, and/or even scary. Sources of costly changes, both in terms of potential dollar outlays and threats to business operations, include contractual agreements; inconvenience involved in ensuring a safe migration from the old to the new provider; learning curve associated with using new products or systems; and loss of tangible rewards or benefits of long-term relationships. Examples of businesses with high-switching costs include Verizon, which generally requires customers to sign up for multi-year contracts with high fees for those who want to end contracts early; Automated Data Processing (ADP), a business payroll and services firm that support efficient payroll processing and regulatory compliance; Stryker, a company that makes medical devices, which surgeons may find difficult to replace due to a learning curve and established acceptance in the medical community; companies that create and market online games in which players accumulate points and advance in ranks; and a local bank, particularly if customers have set up automated deposits and drafts plus have multiple relationships in terms of checking accounts, savings accounts, debit cards, credit cards, and loans. This type of moat is often referred to as the network effect. As more people and organizations adopt a business's product or service, more gain value from this connection, and more profitable activity happens. Often, the business's tools become a must-have or industry standard, further increasing the network's value. Examples of businesses with networks as their economic moats include LinkedIn, a professional networking site; Microsoft with its business software once (or perhaps still) considered standard and its Xbox Live memberships that allow kids to play games online together; eBay, which brings sellers to buyers, and vice versa; MasterCard, Visa, and now PayPal, which benefit from more customers who use certain forms of payment and more merchants that accept these forms of payment. There are certain intangible assets that act as economic moats. These include intellectual property, such as patents, trademarks, copyrights, and proprietary technology; brand names; and goodwill, such as a positive reputation, strong employer-employee relations, and customer base. 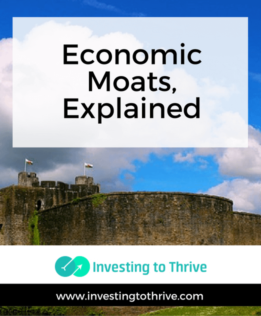 Some companies have economic moats in multiple categories. For example, FedEx has a cost advantage but also benefits from its vast transportation network. Nike benefits from its brand name but also from its product innovation, network of suppliers and retail distributors, and relationships with athletic programs. An economic moat may be wide, narrow, or nonexistent with a wider moat being better and more protective. The size of the moat represents its ability to defend itself from invaders and prevent others from duplicating its business model. This difficulty in copying another company's success is often called a barrier to entry and can be measured in terms of cost, time, and ingenuity. Moats that are strong today may not be strong tomorrow. Determining the strength and the sustainability of the economic moat (an advantage that yields a higher-than-average return) is challenging. But if I can figure out what advantages will not only persist but result in better performance and higher profits, then I may be able to identify economic moats and excel at individual stock selection like Warren Buffett. Disclosure: I own shares of eBay (EBAY), PayPal (PYPL), MasterCard (MA), Nike (NKE), and Chipotle Mexican Grill (CMG).